Andrew Oliver didn’t seem like he would get out of the first inning. Jacoby Ellsbury roped a double at his counterpart in center and swiped third base as Oliver couldn’t get his fastball over the dish. Dustin Pedroia walked on five pitches and took advantage of Oliver’s unease by stealing second. Adrian Gonzalez protected the plate until Oliver sent a pitch that got enough of plate for him to loft into the outfield for a sacrifice fly. Despite his lack of command Oliver got ahead of the count against Kevin Youkilis, notching two straight strikes, one called and one swinging, to begin the at bat. Youkilis waited the pitcher’s sudden competence out and the count evened to 2-2. On the fifth pitch Youkilis increased his franchise-leading hit by pitch mark to 74. With a greenhorn on the mound Terry Francona put on the double steal for Pedroia and Youkilis, not his speediest pair of baserunners despite what Pedroia might say. But with Oliver on the ropes Jed Lowrie and Carl Crawford helped him out by popping out to the infield. While the first inning was a slow evisceration of the Tigers’ pitching and defense Mike Cameron ripped the bandage off with a single stroke in the second inning with a solo homer. Cameron’s graceful transition from a regular to a platoon player along with his ebullient clubhouse presence makes him a well-liked player and a necessary part of mix in the grind of the regular season. Not to be overshadowed Pedroia led off the third with a circuit clout into the bullpens in left. To Oliver’s credit, neither of the Red Sox’s home runs nor the first inning shakiness led to a rout and he left the mound with just a two-run deficit. Clay Buchholz seemed to pitch Oliver’s game in reverse: a solid first three innings but surrendering runs at the end of his appearance. Rookie Andy Dirks launched a four-bagger to kick off the fourth. After Brennan Boesch knocked a homer into the right field stands to bring his team within a run in the sixth the coaches and trainer visited Buchholz at the mound. The starter had stiffness in his lower back and a blister on his right big toe but he stayed in the rest of the inning because of the looming night game. Miguel Cabrera queued a double down the third base line, a sharp grounder that a Youkilis may have snared but Drew Sutton did not. Cabrera advanced to third on Victor Martinez’s ground out and tied the game on Jhonny Peralta’s Texas leaguer. Francona entrusted Matt Albers with the game after Buchholz’s departure. The roly-poly reliever was just one game removed from his abominable performance against the North Siders, but that was in another city and besides the Cubs are dead. In the ninth David Ortiz decided it was time he wrested back the title of clutch player from Crawford and crushed Jose Valverde’s four-seamer into the stands for the lead. The fans at Comerica Park did not lack for a boisterous, over-the-top celebration by a closer, however, because Jonathan Papelbon closed out the bottom of the ninth with two strikeouts. 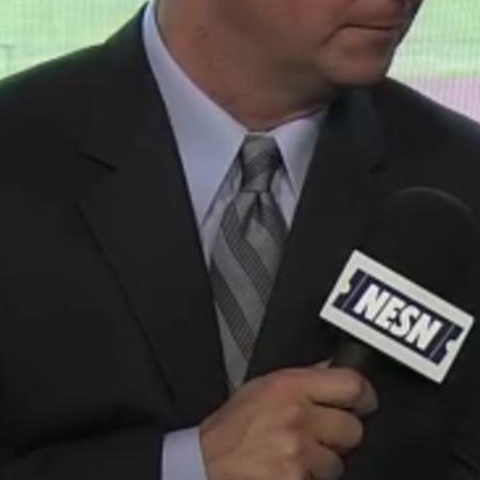 Don Orsillo’s wore a striped grey tie with the darker stripes comprised of stippling. Orsillo and Jerry Remy commented how their road game habits were becoming more alike, eating the same meals at the same restaurants. Sartorially, however, they remain distinct.